Easy to reach all areas of Mendocino County. Pet friendly, dog park 5 minutes away. Local community pool and gym, updated and very inexpensive. Perfect location just up the syreet from glass beach. Walking distance to shops and resturants. A little worn and dated, but for the price, exellent! Where to find Fort Bragg hotels near an airport? 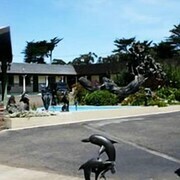 Where can I find hotels in Fort Bragg that are near tourist attractions? 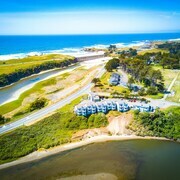 If you are visiting Mendocino Coast and you're looking to book Fort Bragg hotels, you'll find a comprehensive range to choose from. Expedia's comprehensive database lists 21 places to stay that are within 0.1 kilometres (0.06 miles) of downtown Fort Bragg. Visitors hoping to find Expedia-listed hotels and accommodations close to the center of Fort Bragg, can choose from the Atrium Bed & Breakfast and Country Inn. The Fort Bragg area has some lower-priced hotel and apartment options that will be sure to please thrifty vacationers and travelers. 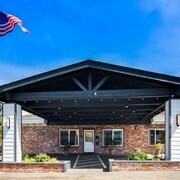 The Best Western Vista Manor Lodge is 1 kilometre (1 mile) from the heart of Fort Bragg, while the Pine Beach Inn is 6 kilometres (4 miles) away. Other budget hotels include the Fort Bragg Travelodge and the Seabird Lodge - a Signature Inn. The Brewery Gulch Inn is situated 17 kilometres (11 miles) from the center of Fort Bragg. Or, alternatively, the MacCallum House Inn is 16 kilometres (10 miles) away. Alternatively you could book the Stanford Inn By The Sea or the The Heritage House Resort. 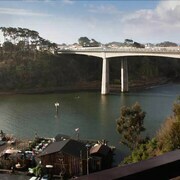 19 kilometres (12 miles) to the south of Fort Bragg is Mendocino, where travelers can enjoy the Albion River Bridge. 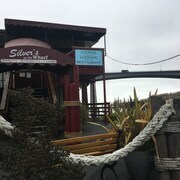 Little River accommodations include the Little River Inn and Cottages at Little River Cove. Or, you could stay at Mendocino, 16 kilometres (10 miles) to the south of Fort Bragg. In Mendocino, take the time explore the Van Damme State Park. Accommodation options in Mendocino include the Hill House Inn and The Mendocino Hotel and Garden Suites. If watching sport is your passion, be sure to visit Lakeport Speedway, which is 90 kilometres (55 miles) to the southeast of Fort Bragg. Book accommodation nearby to the action at the Rodeway Inn & Suites or the Regency Inn. Sonoma County Airport is a logical airport, and is 140 kilometres (84 miles) from Fort Bragg. Nearby accommodation options include Hampton Inn & Suites Windsor - Sonoma Wine Country and Hilton Garden Inn Sonoma County Airport. What are the most popular Fort Bragg hotels? Are there hotels in other cities near Fort Bragg? 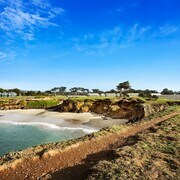 What other types of accommodations are available in Fort Bragg? 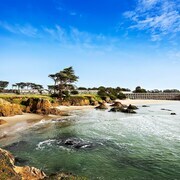 Explore Fort Bragg with Expedia.ca’s Travel Guides to find the best flights, cars, holiday packages and more!